My mom called this movie a “chick flick.” I don’t think it was a chick flick because it involved plenty of drugs and didn’t have any shopping! 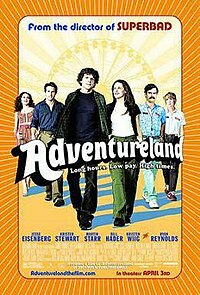 “Adventureland“is a new movie by Greg Mottola, the director of Superbad, starring a crop of new young actors. These aren’t the same old same old people from Superbad and Nick and Norahs. Sure, Bill Hader is there, and he is HILARIOUS in his role. Speaking of, when does this guy get his own movie? I mean come on! Forgetting Sarah Marshall he was the bomb and made me crack up multiple times in this movie too!